The protein supplement Muscle Milk contains up to 50 percent of your daily protein needs in a single serving, and has 20 percent or greater of 20 essential vitamins and minerals. 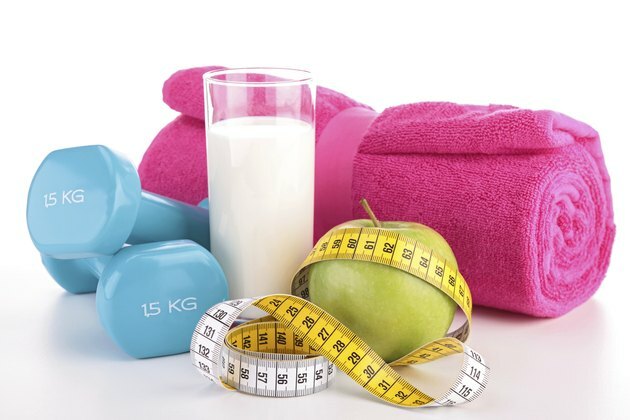 Because Muscle Milk is such a significant source of nutrients, you may want to carefully plan your consumption of the supplement in relation to your meals so you do not saturate your body with energy it cannot use. When you should consume a Muscle Milk supplement in relation to your last meal can be largely affected by your daily protein needs and how much protein was in your previous meal. Sedentary adults only require about 0.8 g of protein per kilogram of bodyweight each day, while the most active athletes need 1.6 g to 1.7 g. Registered dietitian Katy James recommends eating roughly every two to four hours throughout the day to maintain protein levels in your body. As a sample 90 g per day program, James advises eating 13 g of protein for breakfast, 8 g at a mid-morning snack, 17 g for lunch, 5 g for an afternoon snack, 33 g for dinner and 14 g before bed. Consuming Muscle Milk before you exercise can provide you with the protein, carbohydrates and fats you need to perform well and grow muscle. Sports nutrition researcher Jay Hoffman, Ph.D., states that consuming a protein supplement like Muscle Milk immediately before you exercise can increase the amount of muscle growth you experience compared to training alone. Your body fully digests the whey protein in Muscle Milk within 30 minutes, which means you will experience a quick rise in protein levels. To avoid saturating your body with more protein than you can use, consume your previous meal two to four hours before you plan to take the Muscle Milk and exercise. Replacement of nutrients after exercise can be critical to muscle growth and maintenance, particularly if you did not consume a pre-workout meal. When you ate your last meal before exercise does not change the fact that you must replace the muscle glycogen and amino acids you used during exercise. Drinking Muscle Milk within one hour of exercise will help your body maximize the amount of protein you absorb. Drinking Muscle Milk shortly before you go to sleep at night can help to prevent muscle tissue loss overnight due to a lack of nutrients. The casein protein in Muscle Milk digests slowly for up to seven hours. Consuming the protein shake within 30 minutes of sleep — roughly two to four hours after your last meal of the day — will help your body stave off muscle loss during long periods without food.